For all the youngsters here a golden opportunity is offered from Young Parliamentary Associates (YPA) Programme 2018-2019 NTS Test. 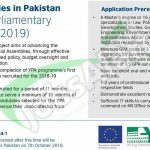 This program is abbreviated as YPA fully known as Young Parliamentary Associates Program is actually initiated by the European Union and the major purpose of this initiating is to recruit and train the young professionals from the various academic background and to support the legislature in Pakistan. As, the program is supporting the legislature and democratic institutions on provincial legislative level so they have started a Project named "SUBAI" which is having the motive to advance the functions of Provincial Assemblies through effective legislation, strong policy, and budget oversight and enhanced representation. Under this Project total of 40 Young Parliamentary Associates (YPAs) will be placed in all 6 provincial and legislative Assemblies. So, these all the details regarding the program now I will let you know about its further details below. Candidates must possess Master’s Degree / 16 years of education from an institution recognized by HEC with a specialization in Law, Political Science, Economics, Development Studies, Governance and Public Policy, Software Engineering, Environment, Public Health, Business Administration, ACCA/CA/PIPFA/CIMA/ICMA are eligible to apply with a minimum GPA score of 3 out of 4, or 3.75 out of 5 or 65% aggregate or Govt. Candidates must possess the excellent oral and written communication skills in English and Urdu with the best demonstration research skills are needed as well. Age limit should be 32 years. Associates will be recruited for a period of 11 months and will have to serve at least 10 months of their associateship. Candidates selected for the YPA Program will commence their associateship in November 2018. Candidates who meet the said criteria are required to apply from the NTS Site or from the given link below. Last Date for submission of Application is September 23, 2018. The test will be held on 07th October 2018. Practicing Law Graduates and Health professionals are highly encouraged to apply. Applicants who are living in remote areas and have a low-income group are strongly encouraged to apply. Last Date For Apply: September 23, 2018.